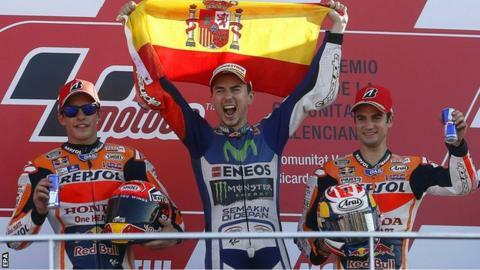 Jorge Lorenzo won the MotoGP title for the third time with victory in the final race of the season in Valencia. The Spaniard, 28, began seven points behind Italian Valentino Rossi, who had to start at the back of the grid as a penalty for clashing with Spain's Marc Marquez in the previous race. Seven-time MotoGP champion Rossi, 36, would have won his first title since 2009 with a second-place finish. But he was fourth as Lorenzo led from pole to win his seventh race of 2015. Britain's Cal Crutchlow began at the very back of the grid after suffering mechanical difficulties shortly before the start, but Rossi was only one place above him and launched a thrilling charge through the field. He gained 11 places on the first lap alone and reached fourth place with 18 of the 30 laps remaining. The charismatic Italian could make no further progress but could still have won the title had the Hondas of Marquez and Dani Pedrosa both passed Lorenzo. Both were closing but their battle for second allowed Lorenzo some precious breathing space and he calmly took the chequered flag. "I was under a lot of pressure, the rear tyre was destroyed," said Spaniard Lorenzo, who was surprisingly subjected to boos from sections of his home crowd. He has now won five world championships in total - three in MotoGP and two racing in the 250cc category. "I just tried to focus and go as fast as possible, the bike was moving around so much. I was praying to finish the race. Now I am five-times world champion, it is easy to say but hard to do. I am very proud. This is a world title for Spain!" Marquez, 22, who relinquished his world title, finished second in the race. He said: "I was preparing an attack for the last few laps but when Dani went past me I lost time. "I tried to take Jorge in the last corner but there was a lot of risk and I nearly lost the front. Second place is not the best way to end the season but next year we will fight for the championship again." Rossi was furious with Marquez after the race, claiming that the Spanish rider went out of his way to prevent the Italian from winning the title. "Today was embarrassing for everybody," he said. "It was unbelievable, the behaviour of Marquez is something very bad for everything, especially for the sport. "It is something that nobody expects, because a Honda rider that made a Yamaha rider win and give the maximum just to push out his team-mate is something that nobody expects and I think it is very, very bad news. "Anyway, it is like this, we have to accept it."